Never have there been so many ways to get into the 500-series format. Does this system have anything different to offer? It seems a month doesn't go by now without the opportunity to review another 500-series system, and the one that I'm looking at this month comes from Polish company IGS Audio, whose Tubecore vari-mu limiter you may recall I looked at back in SOS May 2012 (/sos/may12/articles/audio-tubecore-me.htm). 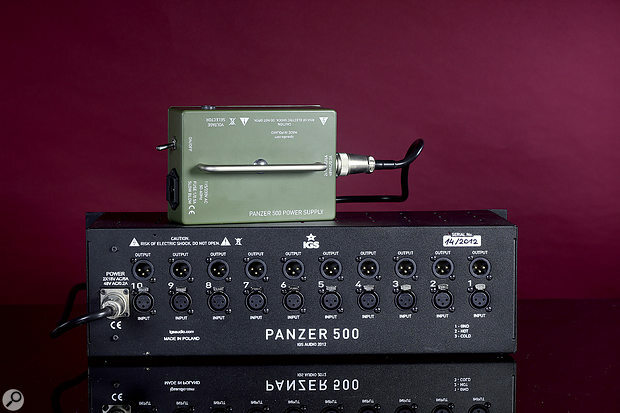 IGS sent me one of their Panzer 500 'lunchbox' chassis with external power supply, and this was accompanied by four modules: a pair of Vanad 500 mic/line/instrument preamps, and one each of their Alter 500 compressors and Rubber Bands passive EQs. The Panzer 500 chassis is as no-nonsense as is possible. The steel enclosure is a rackmount design and houses a circuit board with the EDAC connectors required to accommodate up to 10 modules. (Not bad for 3U of standard 19-inch rackspace, eh?) On the far right, there's a one-module-wide panel which plays host to three LEDs that indicate the presence or otherwise of power on the ±16V rails and the +48V phantom supply. Power itself is delivered via a compact but rugged external unit with its own carry handle, and an average of 420mA is available per module slot. This is firmly attached to the chassis via a cable with super-chunky screw-threaded metal connectors, which is nice. The IEC lead goes in one end, the chassis' power cable out the other, and a robust-feeling toggle switch allows the juice to flow. The audio I/O are presented on the rear of the chassis as 10 individual XLRs for the inputs and another 10 for the outputs, with the pin hot/cold wiring clearly labelled. It couldn't appear simpler, and in tests it worked without problem using the IGS modules and all other modules I tested (about 10 or 12 different modules over the course of the review period). One thing I should note is that the PSU emitted a faint hum (which did not appear in the audio signal path, I hasten to add) when switched on. With the PSU placed in a sensible position, which is possible thanks to the lengthy power cable, this simply wasn't a major issue. I suppose some people may lament the lack of D-sub connectors (which appear on my API six-slot chassis), which make docking such a system in your studio quick and easy, but I really don't think that's a problem — after all, this is clearly designed to be a rackmounted chassis, not a portable 'lunchbox' system as most of the smaller chassis are. Once you have your Panzer, of course, you'll need something to put in the tank! I'll start with the mic pre, whose controls feel wonderfully industrial, the input and output level knobs giving a satisfyingly solid click when switching. That's largely because this design employs switched resistors, rather than rotary pots. As you'd anticipate when looking at the Carnhill input and output transformers, this isn't intended as an entirely transparent-sounding preamp, but rather one which adds a judicious amount of pleasing sonic colour — and it does so very nicely. A closer look at the Vanad 500 mic preamp. Note the Carnhill input and output transformers and the custom-built discrete 2520 op amp. Accompanying the two knobs are four toggle switches, the first enacting a 6dB/octave high-pass filter (30Hz, 100Hz, off), the second distributing phantom power, the third inverting signal polarity, and the last selecting between the mic/line input (via the chassis's rear-panel input) and the front-panel high-impedance input, which takes the form of an Amphenol combi socket. The preamp offers up to 60dB of gain, with 30 of those via the input control and the other 30 via the output level control, both of which work in 3dB increments. 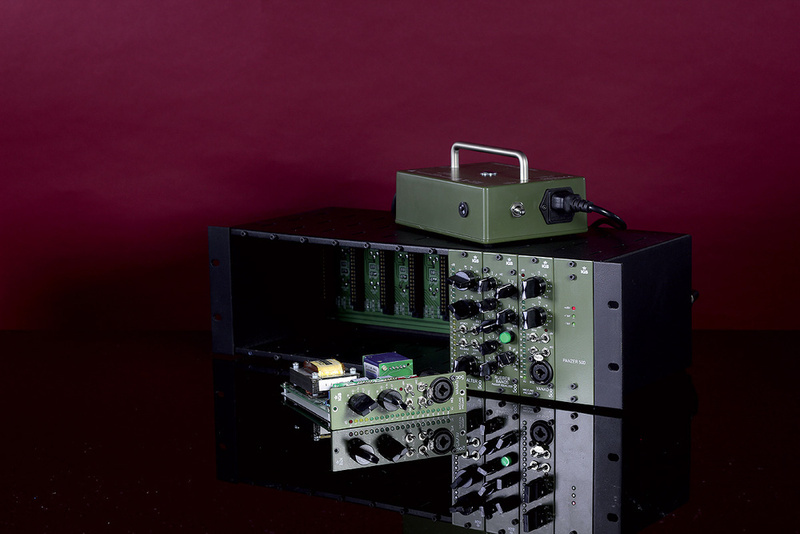 The gain itself is largely taken care of by IGS's own take on the discrete API 2520 op amp. The maximum input that can be accommodated is +20dBU (with the input gain in the line-level position, and the level being indicated on the 20-LED VU meter), with the noise floor being some 99dB below that, while the maximum output is +22dBm. The frequency response is quoted as being within ±0.1dB from 20Hz to 20kHz, and the character that's imparted instead comes via pleasing subtle distortions. The total harmonic distortion is given as less than 0.2 percent. Current consumption, at 60mA is well within the VPR Alliance standards for 500-series modules. The front panels of the three modules manage to cram an awful lot in without things getting too fiddly, with lots of controls on the EQ and 20-LED meters on both the preamp and the compressor. The Rubber Bands EQ is, like the Lindell Audio module I reviewed last month, loosely based on the Pultec EQP1A design, with both a boost and cut for the low frequencies sharing a common centre frequency (selectable between 20, 40, 60, 100, 180 and 240 Hz), and two high-frequency controls benefiting from their own frequency selectors, and with a bandwidth control for the HF-boost control. The high cut can be set to 6, 10 or 20 kHz, and the boost to 5, 6, 10, 12 or 16 kHz. All the frequency selectors are switched, whereas the boost/cut controls themselves take the form of rotary pots. Again, there are Carnhill input and output transformers to take care of balancing and subtle sonic coloration. The EQ bypass is via a relay, the status of which is clearly evident from the well-illuminated bypass button. There are no real surprises here: it's a tried-and-tested design which has been adapted for this format by IGS, and it works very well. It's worth mentioning at this juncture that IGS now also offer both a single-width optical compressor based on the Urei LA4, and an SSL-style bus compressor in a double-width module, both of which are the same price as these modules. I didn't have either here as part of the review system, but I did have the Alter 500 compressor, which is an FET design based on the classic Urei/Universal Audio 1176. There are so many variations on this particular theme now that it's not really worth me describing in detail what the 1176 does. Suffice it to say that, in its various guises, the 1176 is one of the most popular choices for vocals, bass and electric guitar. Whereas the equivalent Lindell unit (see last month's review) added functionality such as side-chain filtering and a blend control, IGS have stuck with the traditional functionality and chosen instead to focus on the range and precision of controls. For example, the controls are all switched types, rather than the pots used in Lindell's device. Ratios of 1, 2, 4, 8, 12 and 20:1 and 'slam' (presumably 100:1 — the famous 'all-buttons' mode on the 1176) are all available, the last via a dedicated toggle switch. The attack and release functions both, like the Lindell equivalent, have three available settings (fast, medium and slow), which are again selectable via a toggle switch. There's also a bypass switch and a useful 20-LED gain-reduction meter, which is generous given the format. Again, then, what we have here is a proven design that has been successfully adapted to this format. The PSU attaches to the no-nonsense rack via a reassuringly industrial-feeling screw-thread connector. Running a range of test material through the preamp EQ and compressor brought reassuringly familiar-sounding results — while I wasn't greeted with any surprises, the sound and operation of these units is good at this price. The solidity of build of all three modules and the presence of true switched settings are to be welcomed. I found that the front-panel legending was a little difficult to read on occasion, and I had to look very closely in a dimly lit studio to see what control I needed to reach for. Perhaps shallower knobs and heavier fonts (as used, for example, on the Inward Connections Magnum preamp I happened to have alongside these modules while writing this review) would be a worthwhile improvement? But this is a superficial issue, and I'm sure familiarity with the units and adequate lighting would improve things no end in this respect. The full technical specifications of all modules and the chassis/PSU are listed on IGS's web site, so rather than list them there I'll just confirm that I found no significant variance from those figures during tests. 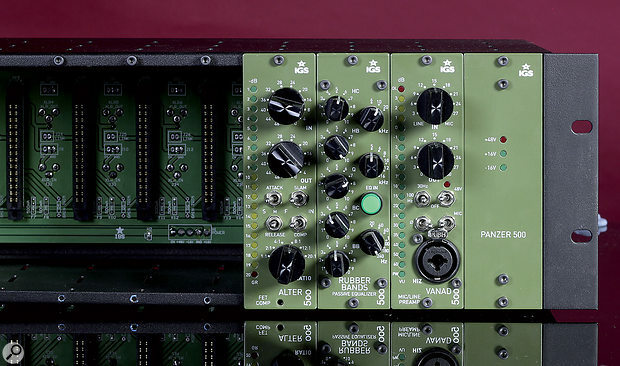 All in all, then, this is a decent modular system for the money, and the fact that IGS seem to be adding more to the range can only be a good thing. For me, though, the star of the show is the Panzer 500 chassis and power supply, which offers a huge amount of 500-series real estate for the money and makes it easy to combine my 500 series and 19-inch rackmount units in a sensible way. 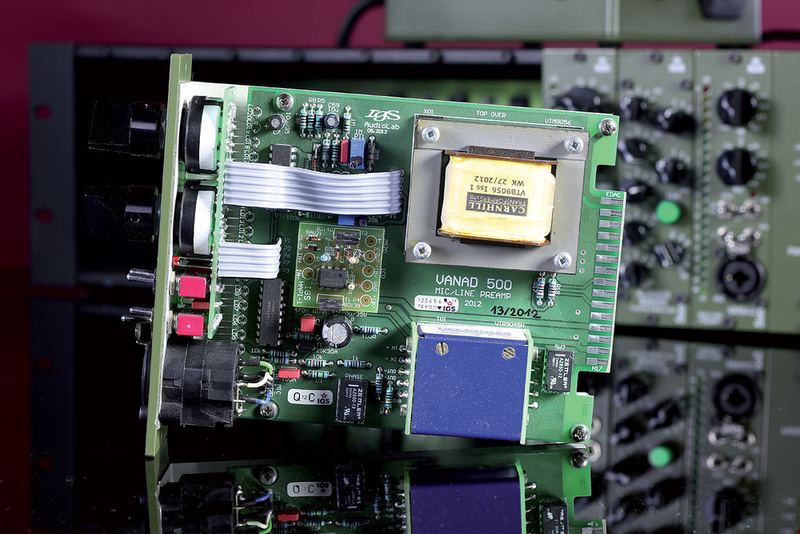 There are various alternatives available, both in terms of the modules themselves and the 500-series chassis. Most notable are the equivalent units offered by Lindell Audio, which are cheaper, but sacrifice some touches such as switched controls for greater functionality, and the range of modules available is more restricted. For equivalents of the other modules not reviewed here, look at JLM Audio and Five Fish Audio, amongst others. Predominantly use stepped switch controls. Up to 10 processors in a 3U rack space. New modules being added to the range. Audible, albeit faint, hum from PSU on the review model. Legending could be easier to read. 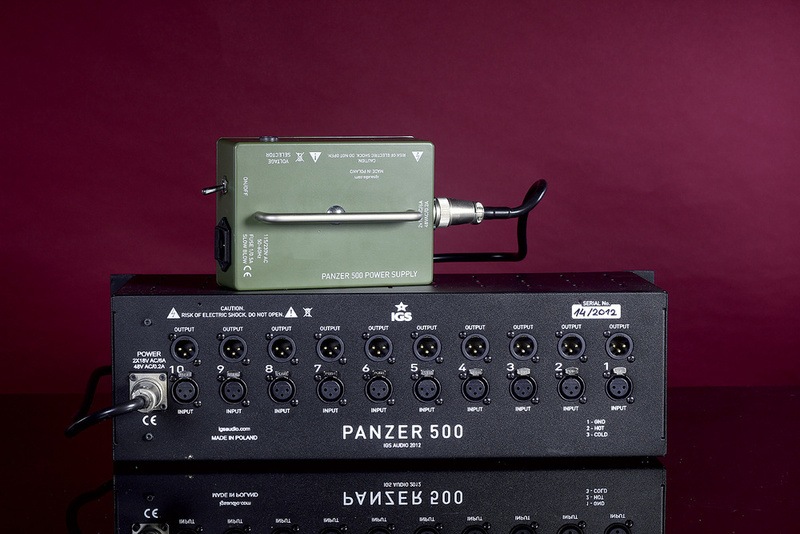 IGS Audio have created a number of useful additions to the 500 series — not least the Panzer 500 chassis, which is the most affordable 10-slot rack I know of. All modules €630 each; Panzer 500 chassis €774. Prices include VAT. IGS Audio +48 (0) 601 597 592. All modules $699 each; Panzer 500 $895. Atlas Pro Audio +1 866 235 0953.